Many USTA league players drive themselves crazy over NTRP ratings. And I don’t blame them. The NTRP rating is supposed to be a reflection of the year you had and determines what leagues you can play in. It’s also fun to anticipate how your match results and a computer algorithm assesses your game. There’s no question in my mind that USTA tried to come up with the best formula it could to determine NTRP ratings. After all, with more than 300,000 USTA league players, there’s no way USTA can go through each person’s record with a fine-tooth comb. That being said, I wouldn’t take your NTRP rating as a truly accurate reflection of your year. Because sometimes people’s year-end ratings don’t make sense. I’m sure you or your USTA league friends have similar examples. If you do, post them in the comments below! The point is that getting bumped up or down doesn’t necessarily reflect how you did over the course of the year. I have many wonderful tennis friends who are constantly thinking about how each match will potentially affect their USTA rating. I’ve been in several doubles matches where my partner has said something to the effect of “If we win 6-0, this will screw up our rating for next year!” Arrrgh! The statement itself may be true, but it’s clear that the NTRP rating, for many, poses too much of a distraction during matches. When you play tennis matches, your goal should be to play your best and give 100% each and every time on the court (a rant to come on that below). Like my college coach Keith Puryear (Episode 2 of the podcast) always says, “focus on the process, not the result.” Any time you start thinking about how your match will affect your rating, you are robbing yourself of optimal play and wasting energy and focus on something that a computer has most of the control over. I love all my USTA friends. But I truly hate how some of them will straight up throw matches to try and not get bumped up. If I play you and you tank, you have not only wasted your time and money, but more importantly to me, my time and money. I think that we should constantly try to improve ourselves and our tennis game. But if you tank matches, you train your body to perform at suboptimal levels by decreasing your intensity and competitive drive. This is also why, per #1 above, ratings can be inaccurate. Let’s say a league player, we’ll call her, Ivanna Tankalot, destroys everyone at 4.5, and then tanks a few matches at the end of the year against weak players and ends up staying at 4.5 (congratu-freakin-lations, Ivanna!). 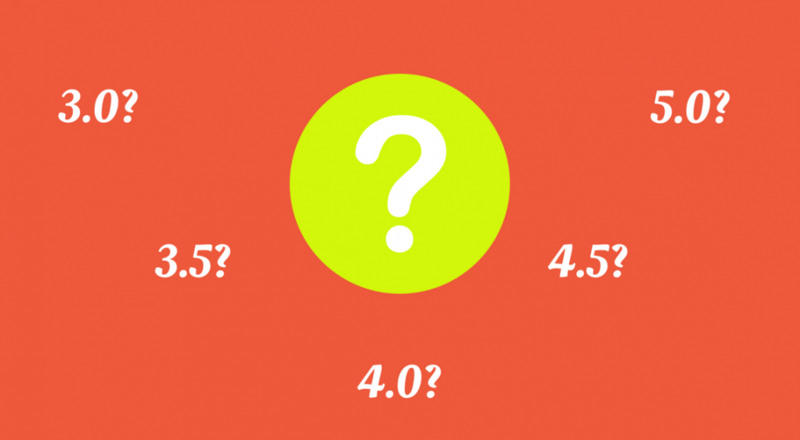 Is 4.5 her truly deserved ranking? Or should she be bumped up to 5.0 because she is fully capable of playing at that level and will be competitive with the 5.0s? I think you know the answer, and Ivanna you to post your thoughts by commenting below (do you see what I did there?). Sure, winning is fun. But to me, playing against higher-level competition that will push you to play your best is a lot more fun, regardless of the result. I’ve been a 5.0 for several years, but looking back on my last 4.5 season where I never lost a 4.5 men’s match, I much prefer the higher level competition. There were many matches in 4.5 where I was on autopilot, or knew I just had to hit 5 balls in and I’d get a short ball to pound on. Coasting will do nothing for my game or yours. I promise you that the better players you play, and more often, the better a player you will become (now I sound like Yoda). I guarantee you that your focus and intensity will level up a notch. I know many of you will say, even if we protect our rating and stay at the same level, we’ll face higher competition when we get to Nationals anyway! But what’s going to improve your game more, playing a top 4.5 player 1-2 times a year, or playing 5.0s all year round? And I don’t blame you for wanting to get to Nationals. After all, it is a very memorable experience. But I’d rather become a better tennis player, and feel the joy of an improved skill set, over destroying people at 4.5 for the next 15 years. This isn’t talked about much, but I know there are players out there who are depressed because they cannot increase their rating by .5 to 1 point after several years of trying. This is certainly not good for your health or tennis game. And after a while, it can cause you to feel overwhelming pressure during matches. During the crucial moments of a match, you do not want to think about how crucial it is to win, because most of us will get tight and play horrible if we do that. The best thing you can do for your game is to focus on your long-term improvement. Sure, maybe the computer rated you a 4.0 again. But how does your game feel over the past few months? Are you training optimally, and giving it 100% effort during practices and matches? Are you implementing good strategy during your matches? What parts of your game has improved? Ask yourself these questions, ignore your NTRP rating (except when you sign up for leagues 🙂 ), and everything will take care of itself. The point is that we as human beings have a limited capacity to focus and make decisions, and you should use it on things that matter, instead of obsessing about USTA ratings. Without the obsession over ratings and match-tanking, more people would be moved to the proper level they should play at. If you have multiple top-level players that destroy their opponents but throw matches, and are able to stay at that level, this is not fair for the rest of the player pool. The top players should be bumped up, otherwise they will continue to dominate a level for which they are too good to be playing. It’s a good thing the 3-person nationals team rule is in place, otherwise you would have the same teams dominate each year (instead of every other year like it is now). And think about the longevity of USTA leagues before you argue that there isn’t anything wrong with the same groups of players winning so often. If other players see the same teams win each year and think the system is flawed, they will drop out of USTA leagues. Could this be a reason for the stagnation of the USTA league player base? I think so. Best of luck playing against ghosts in a few years. I hope that the above points make you think twice about putting so much importance into USTA ratings. It’s fun and entertaining, but can really take away from your overall improvement and even cause harm to the USTA leagues and its players. And whatever you do, do not tank matches. Don’t. do. it.